Warning: this is a long post. I think this is what happens when I write after the Camino ends, when I’ve had time to think about my days and reflect on all that happened. 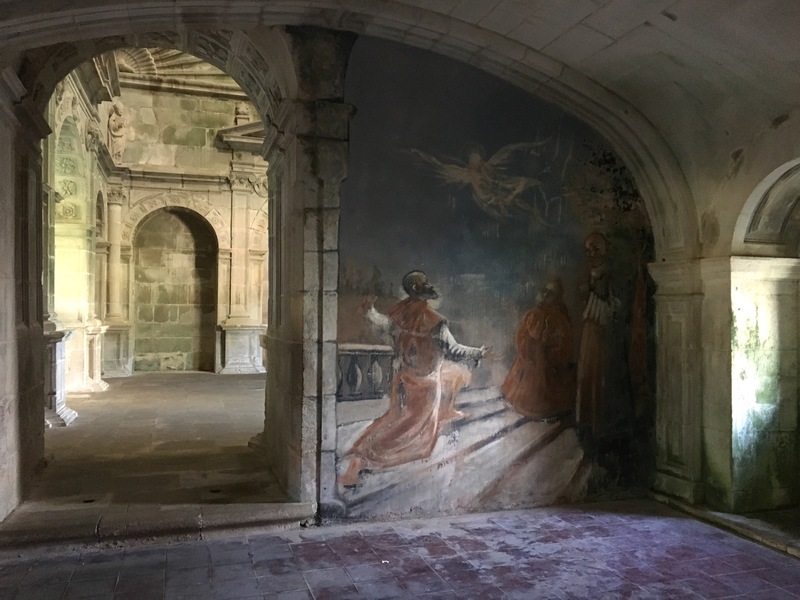 So maybe grab a cup of coffee or a glass of good Spanish wine and read about my last day on the Camino. It seems like each time I do a Camino, I have one perfect day. Or, a day that’s just all-around so good and I feel so happy that I don’t want to even think about it too much- I just want to be in the day, in each moment of it, soaking it all up. 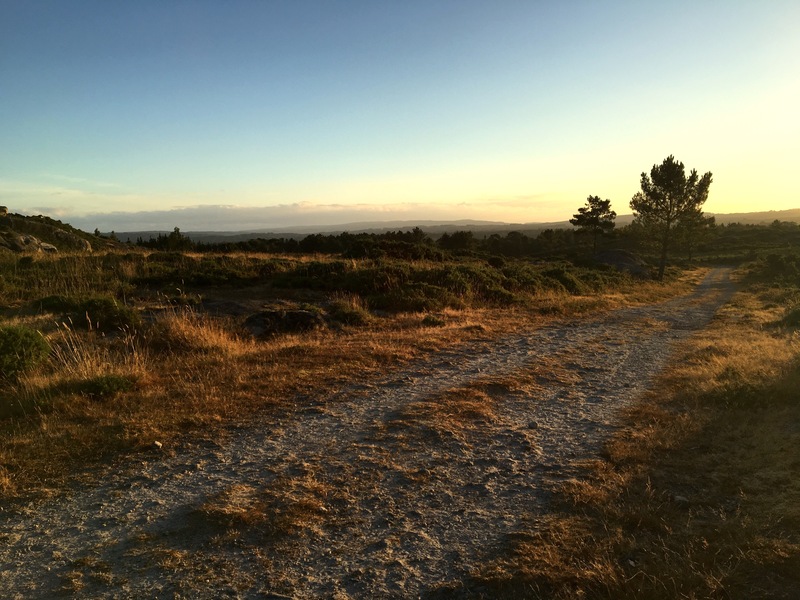 On the Camino Frances it was the day I walked into Burgos; last year, it was the day on the Primitivo when my friends and I cobbled together some food and ate in the garden of the albergue under a setting sun. And this year, it was my very last day on the Camino. How beautiful is that? 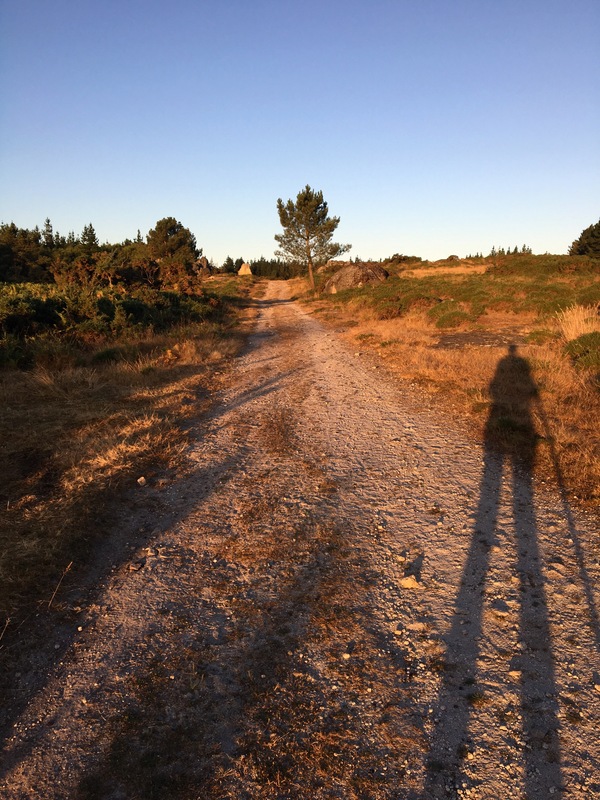 It seemed like good Camino symmetry, that I’d had a rather difficult and isolated time overall, until the very end. And the very end felt magical. All three of these ‘perfect days’ have something in common: I spent them with people whose company I truly enjoyed, people who I felt connected to. 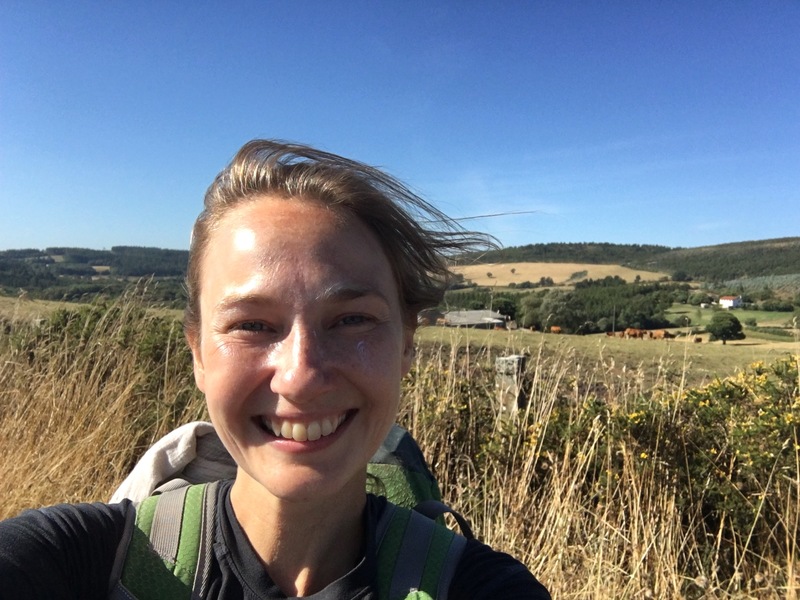 This makes me laugh, because I spend so much time alone on these Camino journeys; walking alone is important to me, facing challenges alone makes me grow, being happy and content with my own company is something I admire about myself. But in the end, I need people. I think we all do. My last post left off in the albergue of Miraz, where I’d eaten a hearty pasta dinner cooked by an Italian woman and eaten with a table full of new friends. I woke in the morning knowing I wouldn’t get an early start- the hospitaleros prepared a simple breakfast for us that they began to serve at 7am, so after a couple cups of strong coffee and a large stack of jellied toast, I didn’t set off until well after 7:30. From my seat at the table in the albergue kitchen, I had watched the light change out the window. At first a dark, almost navy blue that slowly shifted and thinned, turning pale and then pink and orange tinged at the horizon and it was a perfectly clear, pastel colored sky. I sat watching this sky in the albergue, wanting to be out there, walking, but at the same time content to sip my coffee and crunch into another piece of toast and make groggy conversation with the pilgrim sitting across from me. 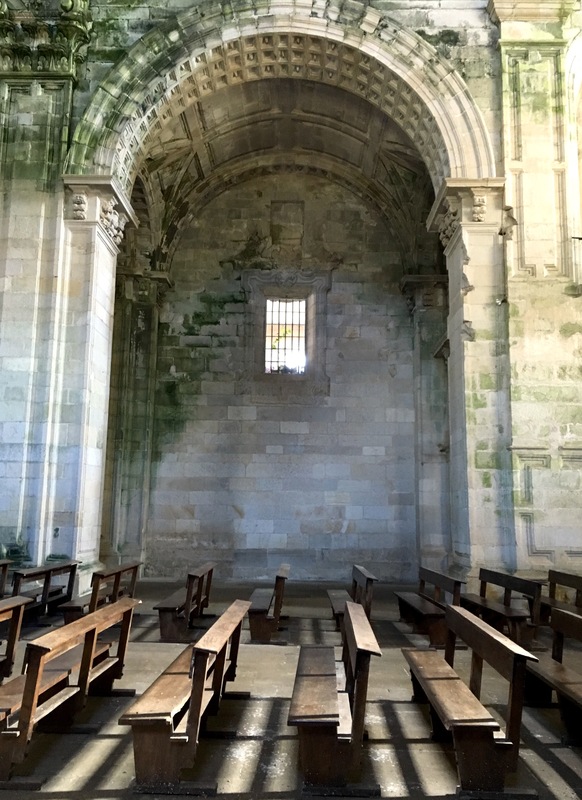 I almost felt like I was beginning to master something on this Camino (though in reality I’ve probably still got lots of work to do): I was able to just be in the moment, letting go of expectation and control of how I thought things should go or how I wanted them to go. I had learned to let go of worry or stress, and to just sort of take each day for what it was going to give me. 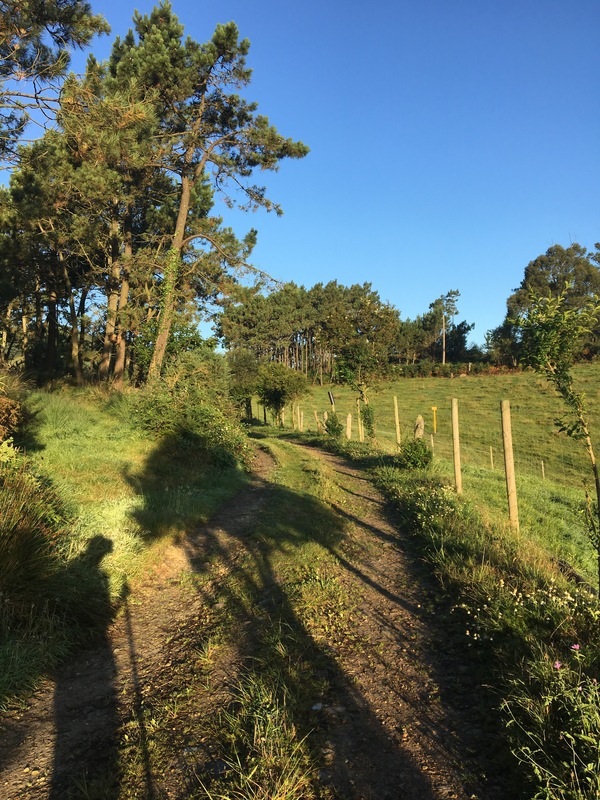 I’m still frustrated that I got sick on my Camino, but if there was one take away, it was that everything felt so much easier once I started to feel better. And that I was reminded that feeling and being healthy is maybe the thing I’m most grateful for; if I have my health then I’m able to walk, I’m able to enjoy the food on the table in front of me, I’m able to smile and talk to a stranger. I’m able to be alive in the world. 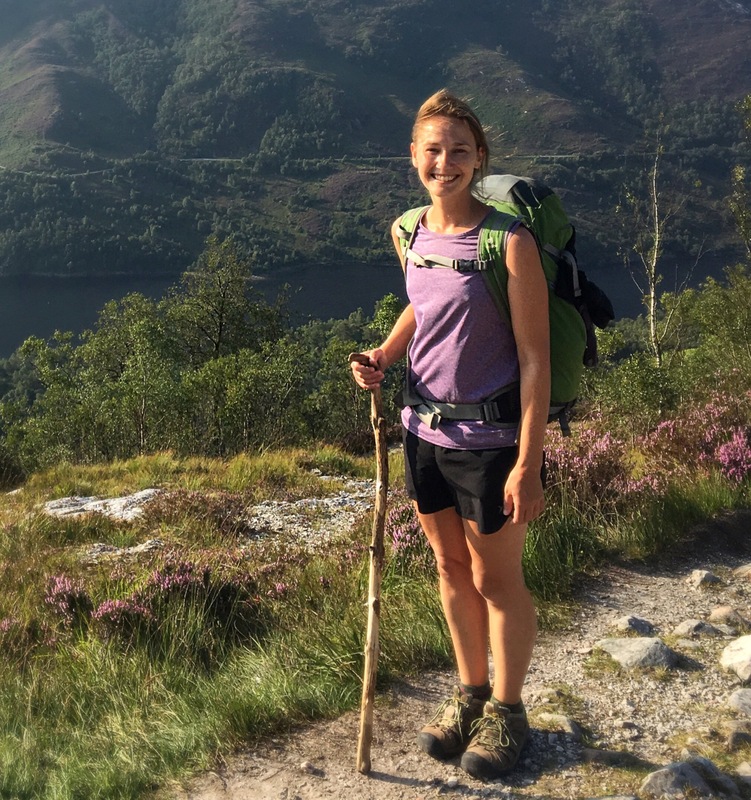 So for the end of my Camino, I felt so settled into my days, accepting of whatever they would look like: if I would be alone, if I would make a new friend, if I would fly through the walk or if I would feel the burn in my legs. I had no need to make my last day into anything- to frantically fill it with all my favorite things, to make sure I drank Rioja wine or to have a cafe con leche break, to ensure that I would walk alone, to walk to a beautiful sunrise, to arrive at an albergue at any given time. Maybe I’d have these things and maybe I wouldn’t; it was okay. This is a long way to open a post about my last day, but I’m reflecting on it now because I think my attitude probably contributed to how beautiful this day turned out to be (and it’s a reminder of how I try to keep living, back at home… it’s awfully hard but I’m trying). When I did finally leave the albergue, full of coffee and bread and the warmth of the hopsitaleros and my new friends, the walk was beautiful. The day was beautiful: it was barely 60 degrees and a strong wind was blowing and the world around me felt a little wild, and free. And by extension, I felt a little wild, and free. I was alone for most of my walk, facing forward but also turning around to catch the sun reaching over the peaks of distance hills. The light was golden and cast long, deep shadows across the reddish dirt and rough stone. I walked, sometimes feeling like I was gliding, being pushed along by the wind. And as I approached my destination, Sobrado dos Monxes (after a 25km walk), I didn’t feel sad or anxious to try to capture the last steps of this year’s Camino, to savor each one. I just felt… good. Just before the small town of Sobrado is a small lake, and sitting off to the side along a stone wall was a big group of Spanish teenagers and a few young adults. One of them flagged me down, and began speaking quickly. When I told them I spoke English, another came over to translate. “Do you know where we are?” he asked. 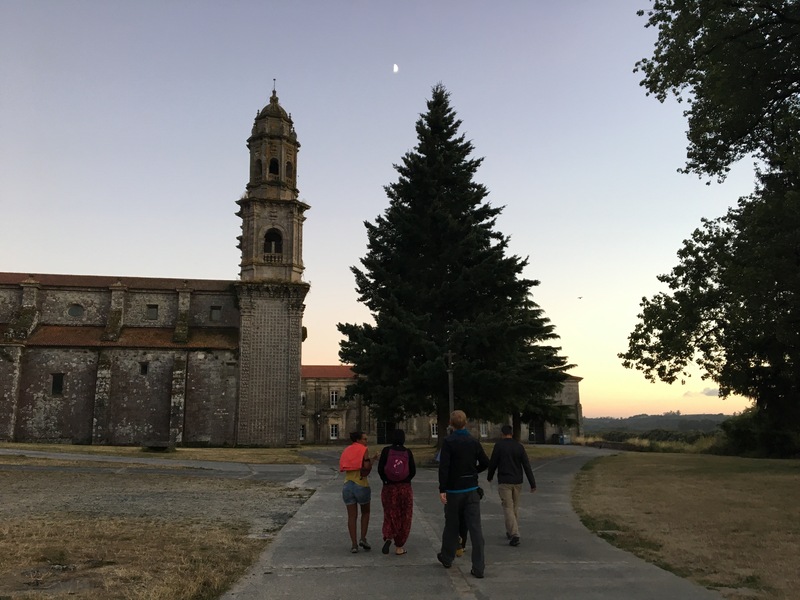 They wanted to know where I had come from- they were walking in the opposite direction, not on the Camino exactly, but maybe on a scouting/camping trip. I mentioned the names of towns I’d seen as I walked, and pulled out my guidebook and pointed at a map, to help them orient themselves. We went back to the main square of the town, looked around, and I picked a bar that had a large black board propped against the wall, listing some items from the day’s menu. After using translators on our phones to decipher the food choices, we ordered and took glasses of wine to a table outside. No sooner had we settled in than Natalie, Silvia, Michael and Matthias walked up (they had made it into the albergue before 1:30). They laughed and cheered when they saw us, and we all crowded around the table, then moved inside when the wind started blowing over chairs and knocking over glasses. My food came out first, and it was then that we realized we had stumbled onto something great. This wasn’t just another Spanish bar with bland lettuce and watery tomatoes, fried slabs of meat, hunks of white bread. I’m sure there are restaurants like this in larger cities on the Camino (I’ve even been to a few good ones), but this was a hidden gem in a small, dusty town. On the outside and on the inside, it looked like any other bar, maybe a touch more modern, a touch more clean. But the food! The guy bringing out our dishes was the chef, and he owned this restaurant. He was young and full of energy and ideas. He could speak some English (which I hadn’t encountered much), and explained that his menu evolved; he aimed to use the freshest, most local ingredients, and so he cooked with whatever was available and in season. And it was evident in the food that we ordered. My salad wasn’t a normal ‘ensalada mixta’: the lettuce looked like it had been picked sometime in the last hour (and maybe it had; it took awhile for the food to get to us). 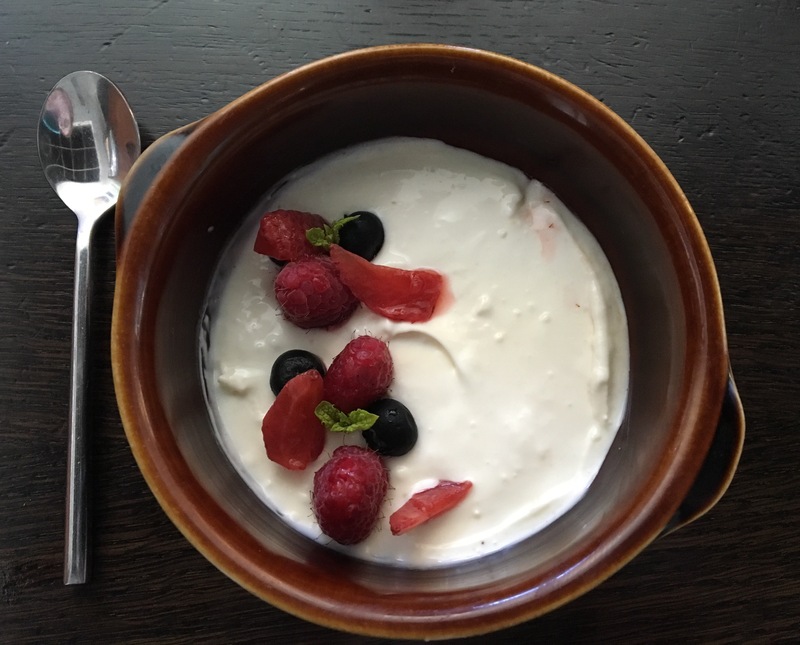 The tomatoes were the right color of red, there were thin slices of radish and a broiled cheese that I couldn’t identify but the flavors burst on my tongue and I scraped up every last bit. My next dish was mounds of smoked salmon piled on top of an avocado mousse and layered on thick toast and there was so much I could only finish it because it was so good. I’m not totally sure of what everyone else was eating because I was so absorbed in own meal, all I know is that everyone was raving over the quality of the food. I saw some sort of pulled pork, and long plates of deep green padron peppers. We drank glasses of wine, and then more glasses of wine. When the chef came to ask us if we wanted dessert, we rubbed our stomachs, looked at each other, and asked what he was making. And it was. After dessert we ordered coffee, because there’s nothing like a strong shot of espresso to end a really long and really good meal. We thanked the chef countless times and raved over his food and he urged us to come back later that night. (I’m kicking myself for not noting the name of this restaurant; my google searches are bringing up nothing). Just as we were leaving, I noticed the two English guys I had passed on my way into Sobrado. One of them- the handsome, blond one with long hair pulled back into a knot at the back of his head- was paying at the bar and I decided to walk over and talk to him. I did it without giving it much thought; he had caught my eye and I wanted to say hi. I was feeling good from the weight of the wine and the fullness of my meal, from the soft morning sunlight and the wild wind, from the freedom I’d felt as I walked and the confidence I had at the end of this journey through Spain. We stood at the bar, talking, then moved outside to where his friend was sitting, then all walked together back to the monastery. We stood in line together and waited to check in, talking about the day’s walk, about where we lived, about our ideas for the future. I was so distracted by the conversation, by the English guy’s light blue eyes and his nice smile that it wasn’t until we were almost at the front of the line that I realized I had left my walking stick behind. My stick! You guys know how much my walking sticks mean to me on these Caminos, and this year was no exception. I’d found the stick on my second day of the San Salvador and it was different than the sticks I’d carried on my other Caminos but I’d learned how to carry it so that it fit into my hand perfectly, I learned to love it. I couldn’t believe that I had gotten distracted by a guy and left it behind. I was about to turn around and go retrieve it, but then I realized that I didn’t need it anymore. My walking was done, the stick had fulfilled its purpose, I was going to leave it behind that day anyway. (I did go back later to look for the stick, but it was gone. And that, despite knowing I was going to leave it behind anyway, made me a little sad). I’m amazed that I don’t have a good photo of this year’s walking stick. So here’s another shadow photo. We got our beds and I showered and a French woman I’d never met before asked if I wanted to share the washing machine with her so I didn’t have to hand wash my clothes. While my clothes were washing I walked around, exploring the monastery. I couldn’t quite believe that I was staying here on my last day of Camino walking. It was my kind of place. Old and nearly abandoned, crumbling and decaying, vines growing through empty windowpanes, the flap of pigeon wings echoing around the vacant spaces. In many ways it was sad to see this beautiful, imposing building left to rot, left behind. But it was also quietly beautiful, more beautiful to me than so many of the gilded and ornate churches that dot the path of the Camino. The rest of the afternoon and evening went by too fast, and I wanted more time. Time to run my errands and wander through the town. Time to write postcards to my friends and family, time to explore more of the monastery, time to talk to my new friends. I was able to do some of this, all of this, but I wanted just a bit more. More, and yet, what I had was enough. A big group of us did go back to the same restaurant where we’d had lunch, we ordered several bottles of wine and plates of tapas and stayed until just before 10:00, and then we had to rush back to the albergue before we got locked out. 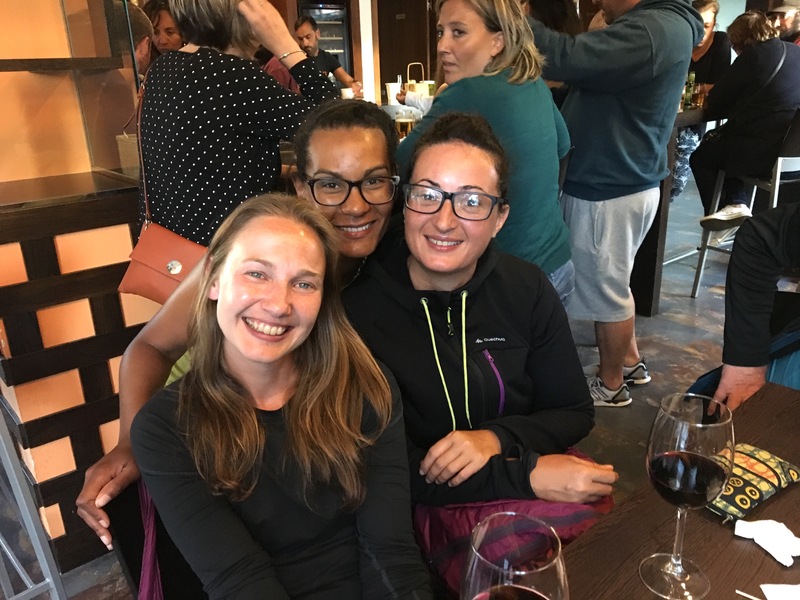 At some point in the evening, Natalie asked me if I was sad that my Camino was over, that I couldn’t continue on to Santiago. And you know, I surprised myself a little that my answer was ‘no’. It would have been wonderful to continue on for two or three more days to Santiago, to try to stick with the group I’d found, and with the people I was continuing to meet. But a few days into the San Salvador I’d known that I couldn’t walk all the way to Santiago this year, and despite my recent connections, I was okay to say goodbye that night. The entire day had felt surrounded by a haze of that ol’ Camino magic- and I was happy. Content with the way I’d walked, excited about a new adventure to come, but mostly just focused on the beautiful place I was in at the moment, the beautiful people surrounding me.